The e-TP609 NCF is a sophisticated, luxuriously made single-chassis power distributor that eliminates many common problems found in audio and video components caused by massively contaminated electrical power lines. How can you tell you’re a victim of polluted mains power? Listen and look for these symptoms: Flat, hard, and grainy high frequencies, a thick and bloated mid-range, fat, uncontrolled bass, and loss of air and sound-stage stability. On video displays the picture resolution is less than sharp, with “ghosting”, color shift, “snow”, or vertical and horizontal lines. If this looks and sounds familiar, you need Furutech! The e-TP609 NCF will allow the delicacy, refinement and nuance of a performance through, along with micro- and macro-dynamics that will leave you breathlessly engaged. All parts contains an “active” damping material, called Nano Crystal2 Formula (NCF) — Nano Crystalline, Ceramic and Carbon Powder. NCF is comprised of a special crystalline material that has two “active” properties. First, it generates negative ions that eliminate static and secondly, it converts thermal energy into far-infrared. Furutech then combines this remarkable crystalline material with nano-sized ceramic particles and carbon powder for their additional “Piezo Effect” damping properties. The resulting Nano Crystal2 Formula is the ultimate electrical and mechanical damping material – only found in Furutech products! Nano Crystal2 Formula eliminates static, “interconverts” thermal, mechanical and electrical energy and damps vibrations – all for the finest Furutech Pure Transmission signal imaginable. The beautifully crafted special grade aluminum chassis effectively shields against another common problem, RFI (Radio Frequency Interference) and a layer of Formula GC-303 (see below) blocks EMI (Electro Magnetic Interference). Internal wiring is Furutech α-22, 3.8 sq. mm (< 12 AWG), that guarantees low electrical resistance. 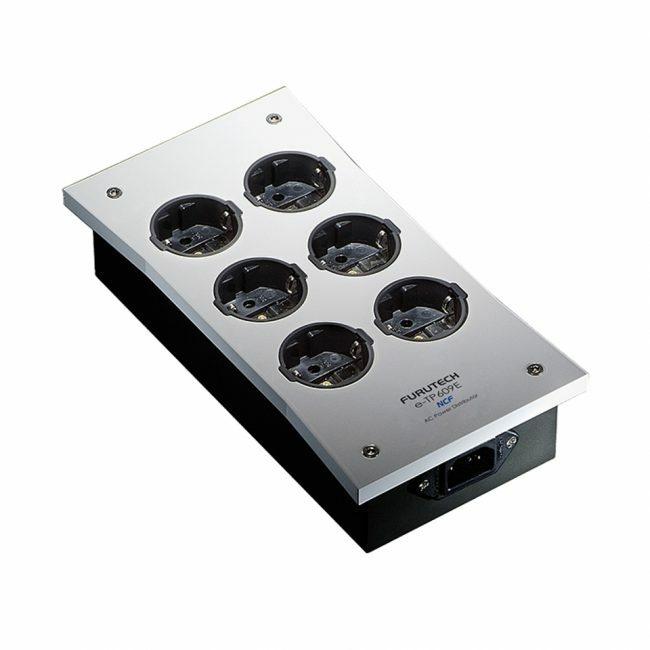 The e-TP609E has been fitted with Furutech high-end performance FI-E30(R) NCF SCHUKO Sockets that are “star-wired” to the High End Performance FI-09(R) NCF IEC AC input of the e-TP 609E. They feature Rhodium-plated phosphor bronze, non-magnetic conductors for stable, long lasting, optimized power transfer. GC-303 is a special material Furutech bonds to the interior bottom-plate of the chassis (see illustration below) that absorbs EMI (Electromagnetic Interference) generated by the internal fittings of the unit. The e-TP 609 / e-TP609E uses no filtering besides Formula GC-303 so AC resistance is kept to a minimum, allowing a more resolving, powerful, dynamic, and colorful performance from your components. Furutech designed a special locking screw that anchors each US duplex receptacle / SCHUKO socket, thus preventing oscillation and enhancing long-term stability. Further, a special 3M material isolates the US duplex outlets / SCHUKO sockets from resonance. Total attention to detail: Each Axial Lock is torqued to perfection to work with the 3M resonance control material, with 4 spikes provided to mount the entire unit. (1) Using cutting-edge technology and materials, Furutech developed a low-temperature two-stage process that significantly improves every facet of audio and video performance. The treatment begins during the manufacturing process with a deep, conditioning cryogenic freeze of all metal parts. Using high-end refrigerants — liquid N2 or He — Furutech achieves temperatures of between -196 to -250C. The treated parts actually change their molecular structure at these extremes of temperature relieving internal stress. The molecules bond together more tightly and the overall structure becomes more stable. This improves electrical conductivity and so power and signal transfer. (2) Step two in the Alpha Process exposes these same parts to the patented Ring Demagnetization treatment. Ordinary high power magnets used for this purpose often increase magnetization effects; they leave some areas more magnetized than others. Just like a CD spinning over a fixed magnet; when the CD stops the area above the magnet is still exposed to the magnetic field causing audible effects. This patented process uses controlled attenuation to completely eliminate magnetization for immediately more vivid and colorful improvements. Ring Demagnetization further enhances conductivity of all treated materials. The patent holder for this treatment is Sekiguchi Machine Selling Co., Ltd. in Japan; Furutech are licensed users of the technology. Furutech’s total awareness and devotion to detail results in a greater sense of power, dynamics, and resolution, with cleaner, blacker backgrounds and a larger, more stable soundstage, vivid tonal colours and deeper extension at both ends of the frequency range. The Pure Power 6 NCF will allow the delicacy, refinement and nuance of a performance through, along with micro- and macro-dynamics that will leave you breathlessly engaged. Displays of all types will exhibit greater, sharper resolution with less ghosting, colour shift, `snow`, or vertical and horizontal lines.